The following is from Martha Stout, Ph.D., in her book, The Sociopath Next Door (pages 156-162). These are good guidelines for anyone who knows, works with/for, or have been involved with a sociopath. 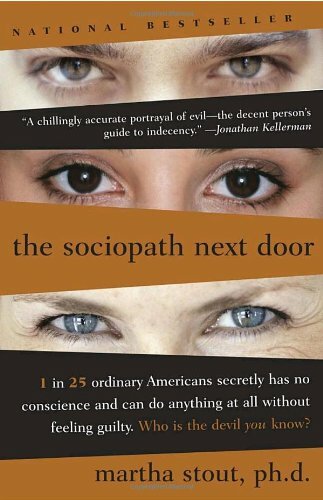 As Stout points out, sociopaths are not rare--we all are likely to encounter one (or more) at some point in our lives. Considering that this blog has been very focused on unmasking Marc Gafni as the sociopath he is, this seems like a fitting part of that process. 1. The first rule involve the bitter pill of accepting at some people literally have no conscience. These people do not often look like Charles Manson or a Ferengi bartender. They look like us. 2. In a contest between your instincts and what is implied by the role a person has taken' on--educator, doctor, leader, animal lover, humanist, parent--go with your instinct. Whether you want to be or not, you are a constant observer of human behavior, and your unfiltered impressions, though alarming and seemingly outlandish, may well help you out if you will let them. Your best self understands, without being told, that impressive and moral-sounding labels do not bestow conscience on anyone who did not have it to begin with. 3. When considering a new relationship of any kind, practice the Rule of Threes regarding the claims and promises a person makes, and the responsibilities he or she has. Make the Rule of Threes your personal policy. One lie, one broken promise, or a single neglected responsibility may be a misunderstanding instead. Two may involve a serious mistake. But three lies says you're dealing with a liar, and deceit is the linchpin of conscienceless behavior. Cut your losses and get out as soon as you can. Leaving, though it may be hard, will be easier .now than later, and less costly. Do not give your money, your work, your secrets, or your affection to a three-timer. Your valuable gifts will be wasted. Once again--trust your own instincts and anxieties, especially those concerning people who claim that dominating others, violence, war, or some other violation or your conscience is the grand solution to some problem. Do this even when, or especially when, everyone around you has completely stopped questioning authority. Recite to yourself what Stanley Milgram taught us about obedience: At least six out of ten people will blindly obey to the bitter end an official-looking authority in their midst. The good news is that having social support makes people somewhat more likely to challenge authority. Encourage those around you to question, too. Compliments are lovely, especially when they are sincere. In contrast, flattery is extreme and appeals to our egos in unrealistic ways. It is the material of counterfeit charm, and nearly always involves an intent to manipulate. Manipulation through flattery is sometimes innocuous and sometimes sinister. Peek over your massaged ego and remember to suspect flattery. This "flattery rule" applies on an individual basis, and also at ' the level of groups and even whole nations. Throughout all of human history and to the present, the call to war has included the flattering claim that one's own forces are about to accomplish a victory that will change the world for the better, a triumph that is morally laudable, justified by its humane outcome, unique in human endeavor, righteous, and worthy of enormous gratitude. Since we began to record the human story, all of our major wars have been framed in this way, on all sides of the conflict, and in all languages the adjective most often applied to the word war is holy. An argument can easily be made that humanity will have peace when nations of people are at last able to see through this masterful flattery. Just as an individual pumped up on the flattery of a manipulator is likely to behave in foolish ways, exaggerated patriotism that is flattery-fueled is a dangerous thing. 6. If necessary, redefine your concept of respect. Too often, we mistake fear for respect, and the more fearful we are of someone, the more we view him or her as deserving of our respect. I have a spotted Bengal cat who was named Muscle Man by my daughter when she was a toddler, because even as a kitten he looked like a professional wrestler. Grown now, he is much larger than most other domestic cats. His formidable claws resemble those of his Asian leopard-cat ancestors, but by temperament, he is gentle and peace-loving. My neighbor has a little calico who visits. Evidently, the calico's predatory charisma is huge, and she is brilliant at directing the evil eye at other cats. Whenever she is within fifty feet, Muscle Man, all fifteen pounds of him to her seven, cringes and crouches in fear and feline deference. Muscle Man is a splendid cat. He is warm and loving, and he is close to my heart. Nonetheless, I would like to believe that some of his reactions are more primitive than mine. I hope I do not mistake fear for respect, because to do so would be to ensure my own victimization. Let us use our big human brains to overpower our animal tendency to bow to predators, so we can disentangle the reflexive confusion of anxiety and awe. In a perfect world, human respect would be an automatic reaction only to those who are strong, kind, and morally courageous. The person who profits from frightening you is not likely to be any of these. The resolve to keep respect separate from fear is even more critical for groups and nations. The politician, small or lofty, who menaces the people with frequent reminders of the possibility of crime, violence, or terrorism, and who then uses their magnified fear to gain allegiance, is more likely to be a successful con artist than a legitimate leader. This too has been true throughout human history. 7. Do not join the game. 8. The best way to protect yourself from a sociopath is to avoid him, to refuse any kind of contact or communication. Psychologists do not usually like to recommend avoidance, but in this case, I make a very deliberate exception. The only truly effective method for dealing with a sociopath you have identified is to disallow him or her from your life altogether. Sociopaths live completely outside of the social contract, and therefore to include them in relationships or other social arrangements is perilous. Begin this exclusion of them in the context of your relationships and social life. You will not hurt anyone's feelings. Strange as it seems, and though they might try to pretend otherwise, sociopaths do not have any such feelings to hurt. You may never be able to make your family and friends understand why you are avoiding a particular individual. Sociopathy is surprisingly difficult to see, and even harder to explain. Avoid him anyway. 9. Question your tendency to pity too easily. Related to this--I recommend that you severely challenge your need to be polite in absolutely all situations. For normal adults in our culture, being what we think of as "civilized" is like a reflex, and often we find ourselves being automatically decorous even when someone has enraged us, repeatedly lied to us, or figuratively stabbed us in the back. Sociopaths take huge advantage of this automatic courtesy in exploitative situations. 10. Do not try to redeem the unredeemable. At some point, most of us need to learn the important, if disappointing, life lesson that, no matter how good our intentions, we cannot control the behavior--let alone the character structures--of other people. Learn this fact of human life, and avoid the irony getting caught up in the same ambition he has--to control. If you do not desire control, but instead want to help people, then help only those who want to be helped. I think you will find this does not include the person who has no conscience. 11. Never agree, out of pity or for any other reason, to help a sociopath conceal his or her true character. "Please don't tell," often spoken tearfully and with great gnashing of teeth, is the trademark plea of thieves, child abusers--and sociopaths. Do not listen to this siren song. Other people deserve to be warned more than sociopaths deserve to have you keep their secrets. If someone without conscience insists that you "owe" him or her, recall what you are about to read here: "You owe me" has been the standard line of sociopaths for thousands of years, quite literally, and is still so. It is what Rasputin told the empress of Russia. We tend to experience "You owe me" as a compelling claim, but it is simply not true. Do not listen. Also ignore the one that goes, "You are just like me." You are not. Do not allow someone without conscience, or even a string of such people, to convince you that humanity is a failure. Most human beings do possess conscience. Most human beings are able to love. 13. Living well is the best revenge.